WASHINGTON, July 2, 2018 /Christian Newswire/ -- President Donald J. Trump will announce his nomination to replace retiring Justice Anthony Kennedy to the U.S. Supreme Court on Monday, July 9, 2018. "I have complete confidence that President Trump will do the right thing and keep his promise to appoint a Supreme Court Justice with a judicial philosophy consistent with protecting human life from the moment of conception," said Operation Rescue President Troy Newman. "The battle for the lives of future innocent children is on, and we plan to be there for the President in support of his nominee." 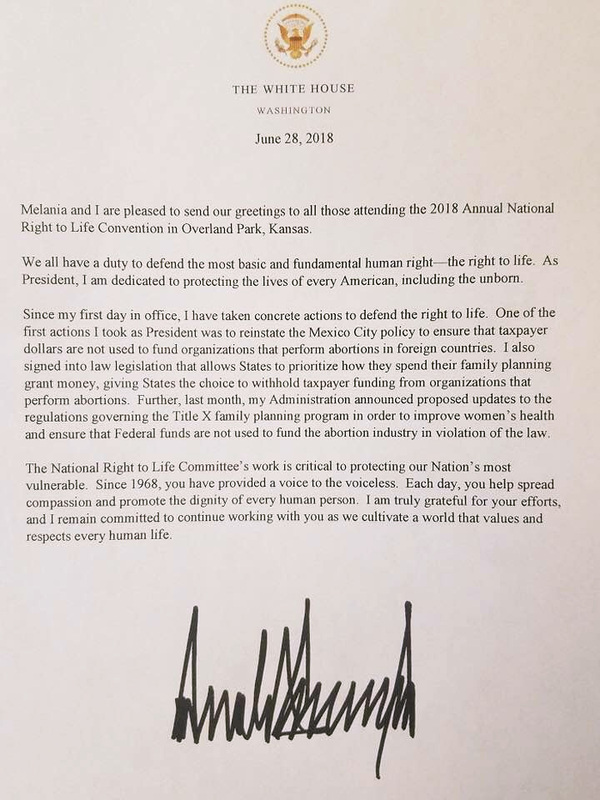 In a letter dated June 28, 2018, which was read at the National Right to Life Convention in Overland Park, Kansas, Trump stated, "We all have a duty to defend the most basic and fundamental human right - the right to life. As President, I am dedicated to protecting the lives of every American, including the unborn." On Sunday, Trump appeared on Fox News and told Maria Bartiromo that although he was not going to ask interviewees if they would overturn Roe v. Wade, he emphasized, "but I'm putting conservative people on and I'm very proud of Neil Gorsuch." Trump has also indicated he wanted to appoint someone who could serve on the court for 40-45 years and is considering two women as possible replacements for Kennedy. Trump has promised to chose from a list of 25 possible nominees vetted by the conservative Heritage Foundation that was released prior to the election. "This nominee to the nation's highest court will shift the balance away from the liberal activists that embrace abortion and toward a judicial philosophy that embraces Constitutionalism," said Newman. "It is very clear that the barbaric practice of killing of babies in the womb is not mentioned in the Constitution, however the right to 'Life, Liberty and the pursuit of Happiness' is a founding principle of our nation enshrined within the Declaration of Independence. There can be no liberty or pursuit of happiness without the right to life." Operation Rescue is looking forward to President Trump's announcement of his selection to replace Justice Kennedy and will fight for his pro-life nominee in what is expected to be a contentious nomination battle. Read this release on Operation Rescue's website.